celebrate after the Highlanders narrowly defeated the Thunderbirds in the last dual meet of the season. For anyone who is a fan of high school athletics the wrestling match between Shorewood and Shorecrest on Friday night was as exhilarating as you could ever imagine. Shorewood, the host school, came in having won nine straight matches against their crosstown rivals in the Spartan Cup series. Shorecrest, reigning team champions of the Shoreline Invitational tournament the two teams co-hosted just three weeks ago, trotted out a line-up loaded with six seniors and a star freshman. The only disappointment on this night was that the hype hadn’t been grand enough. The match began in the old-school way at 106 pounds. Shorecrest gambled and gave up a win by forfeit and the free six team points it provides by sliding star freshman Thomas Rhodes up to the 113 weight class to face Shorewood junior Kai Layton. After testing each other out for most of the first period Layton bullied his way to the first takedown and a 2-0 lead. Rhodes responded with a quick escape to narrow the gap to 2-1 just before the round ended. Neither wrestler was able to score in the second period as Layton clung to the narrowest margin. In the third period, Rhodes quickly scored a second escape to tie it up before getting a takedown of his own on the way to a gritty 5-2 win and a 3-0 early lead in the team score for Shorecrest. That first match set the tone for an extremely close and intense match. After Shorecrest senior Roman Shadduck dominated his way to a 17-2 tech fall win over his opponent at 120 pounds, Shorewood finally responded. Shorewood scored their first team points thanks to a 9-4 victory by sophomore Aidan Jung at 126 pounds. In the next match, at 132 pounds, T-Bird junior Curt Tanaka faced off against Scot senior Kelvin Schmidt. Each wrestler struggled to score any points in the defensive battle as Tanaka eked out a tight 3-2 win. At 138 pounds it was strength against length as Shorecrest junior Kaiya Conway, ranked #9 in the state, faced off against Shorewood junior Kody Carpenter. Using his longer reach, Carpenter attacked Conway's legs with sweep singles as he built a 5-3 lead after the first round. In the second round it was all Conway, powering straight through Carpenter for a pair of takedowns and an 8-7 lead. In the third period, Carpenter started on bottom and struggled to get away. After Carpenter fought his way to his feet, Conway refused to let go of the leg and tried to drive Carpenter back to the mat. Using Conway's momentum, Carpenter flipped him to his back for a takedown and three-point near fall for a 12-8 win. The huge victory gave Shorewood its first team lead at 9-8. After a 14-4 win by Shorecrest’s Arthur Christopher at 145 pounds and a 5-2 win by Shorewood’s Devin Leach at 152 pounds, the two rivals stood tied at 12 team points apiece with six weight classes to go. Shorewood moved sophomore Cole Becker up from his usual 152 pound weight class to wrestle against Shorecrest senior Yacob Benazouz at 160 pounds. In the opening seconds of the match Benazouz lifted Becker high over his head and took him down straight to his back. Becker survived the early throw and escaped the period trailing 7-4. Benazouz continued to use his size and strength advantage in the second period as Becker was only able to narrow the deficit by one point to 9-7. In the third period Becker got a quick escape to pull within one point. Benazouz thwarted numerous attacks on his legs and appeared to be holding strong for the victory. Becker never quit attacking and with under a minute left got a takedown and turned Benazouz to his back. As the seconds ticked down the two wrestlers gave every ounce of effort within their bodies, but Becker got the pin with just 7 seconds remaining. Rising to his feet in victory Becker unleashed a primal scream towards his teammates that would have echoed through the gymnasium if it had not been drowned out by the eruption of the home crowd. Sadly, the referee determined the yell by Becker was unsportsmanlike and penalized Shorewood one team point, leaving them with a 17-12 lead. Shorecrest immediately answered in the 170 pound match as senior Ian Mortenson was in complete control while he secured a 10-1 win over Shorewood freshman Max Null. 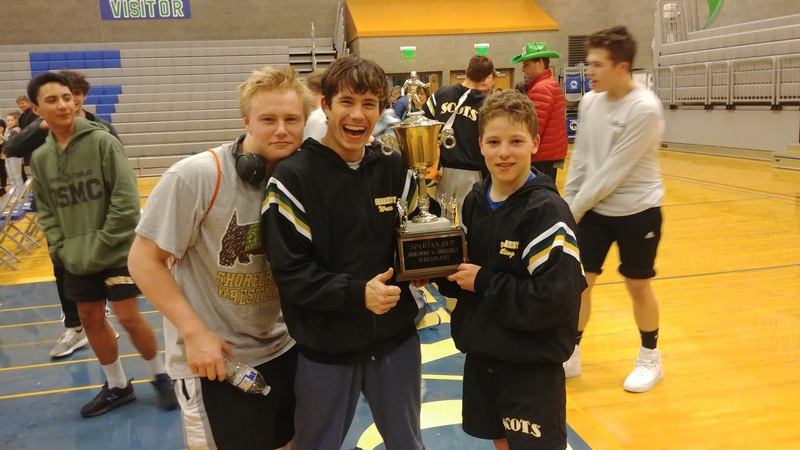 After a pair of victories by Shorewood’s Tom Bert and Phil Ball at 182 and 195 pounds gave the home team a 26-16 lead Shorecrest had only two weights left to try and reclaim the Spartan Cup. At 220 pounds, Shorecrest sent out senior Elyjah Schultz against Shorewood freshman Isaac Kabuchi. Kabuchi did everything he could to hold off Schultz, trailing just 3-1 when the first period ended. The superior strength and experience of Schultz won the day in the second period as Shultz was able to wear out his opponent and get the pin. Fittingly, it was one final Shorecrest senior that put the final nail in Shorewood’s coffin. At 285 pounds, Shorecrest’s sixth and final senior David Rivera walked onto the mat and accepted a forfeit with the six team points that accompany it for a dramatic 28-26 Shorecrest win. The score was the closest win by either team in over two decades. Both teams wrestle next next Friday and Saturday at the district tournament. The tournament is being held at Edmonds-Woodway High School. Wrestling begins at 5pm on Friday the 1st and at 10am on Saturday the 2nd.